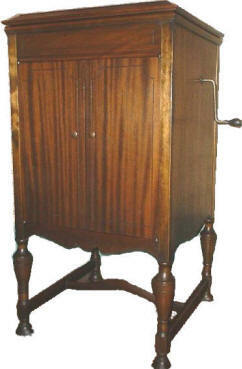 The Consolette was one of the first four Orthophonic Victrola models introduced in late 1925. It was a low-cost, small console-style machine that was quite popular with middle-class Americans. This model remained in production into early 1929, indicating that it remained a strong seller. The Consolette was available only with a mahogany finish, and included an Orthophonic Reproducer, exponential horn, and nickel plated hardware (an antique bronze finish was used at the end of the production run). Early production versions (left) had no grille cloth covering the horn opening and used a simple single spring motor, with a small 10" turntable. In early 1926, the turntable was enlarged to 12" and a double spring motor and grille cloth was added. Shortly thereafter, the automatic brake feature was added. 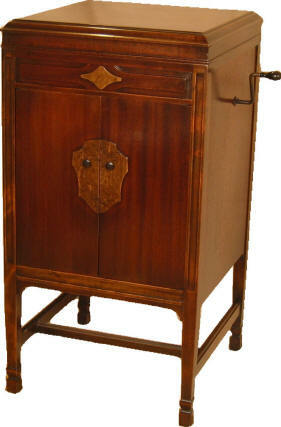 In mid-1927, the cabinet design was modernized (right), with a more squared-off appearance. The original 1925 selling price of the 4-3 was $85.00. The price was later raised to $95.00. An estimated total of 234,323 hand-wound Victrola 4-3's were produced, making it the most popular of the full size (non-portable) Orthophonic phonographs. The 4-3 was also available with an electric motor option (VE 4-3) for $35.00 extra. The production logs show that a total of 7,428 of these machines were produced, however the serial numbers of surviving examples indicate that at least 8,000 were made. NOTE: The production numbers below are base on our best estimates, as factory records are very inaccurate (and conflicting) on this model. 1926 10369-65500 Name changed to "4-3" and turntable enlarged to 12" in the Spring of 1926. Auto brake added at s/n 39501. Do you own a Consolette? Please take a moment and enter some basic information about your machine into the collector's database by clicking here. No personal information is required.